Blogs are certainly a big deal these days because of their high informative value. Isn’t it easy to find blogs related to almost anything on the net these days? This holds true for blogs as well and a well-chosen theme can always accentuate the value of a blog to a massive extent. In this post, we will share some of the Best Squarespace Templates for Blog. 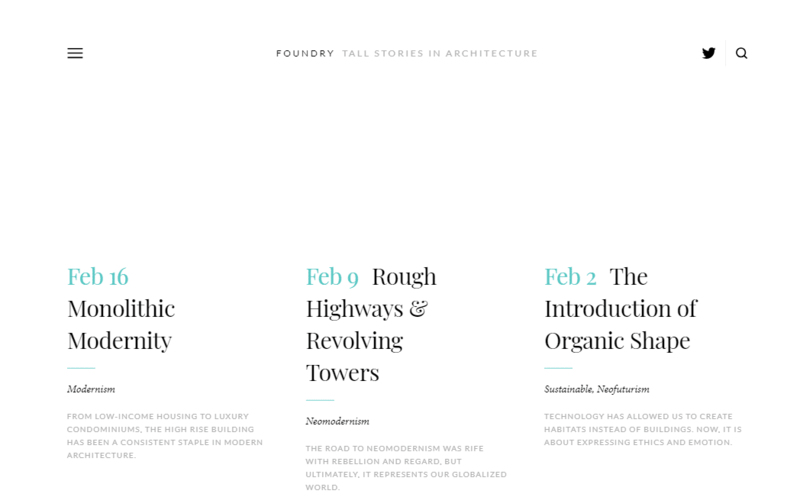 Foundry is an amazing template that lays more emphasis on the text aspect of the content more than the visual aspect. It offers a very clean layout and a beautiful topography that cannot only right away catch the attention of the visitors but also, keep the visitors engaged to a very large extent. The template is especially good for those bloggers that possess powerful writing skills. Skye is a template designed in the magazine style that offers a brilliantly streamlined browsing experience with the right mix of the various elements and an incredibly balanced grid layout. 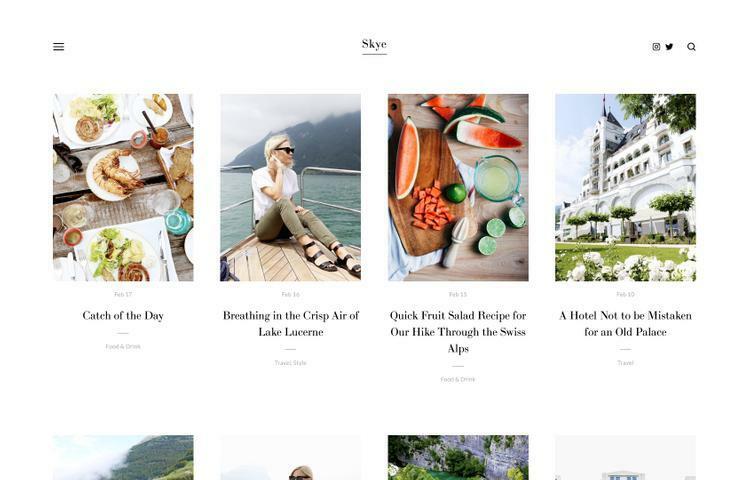 For bloggers who want their blogs in the magazine style, Skye is certainly the ideal template to choose. With a template like Skype, one can undoubtedly have a blog that would stand out amongst the other blogs in terms of looks and engagement. Tudor is a brilliant template that allows you to offer your reader an excellent dynamic experience by its exceptionally beautiful grid layouts that can actually adapt to the size of the images. Besides, Tudor offers a multi-author and a magazine style layout with a collapsible side panel which certainly will help one's blog look extremely exquisite. If you are looking for a template with functionalities such as full-screen header and borderless grid layout, Haute is the ultimate template you can go with. Also, the template is extremely stylish and sleek that can instantly catch the attention of the visitors. Also, borderless grid layout helps your visitors have a consistently better and simpler experience which will eventually elevate the level of engagement. Farro offers an absolutely incredible layout to convert your blog into an eye catchy publication and of course, it allows you to build an unimaginably balanced landing page. With Farro, you can certainly have the best layout for your editorial posts that would eventually make your posts look more appealing and more engaging for the readers. Farro uses a smart combination of images and grid to convey the exact idea of your blog instantly to your visitors and also, keep them engaged. Native is a pretty powerful template which is much preferred by businesses and bloggers because of its versatile and modern nature. No matter what type of content one is trying to promote, this template can easily adapt to it and in fact, it can make your posts look absolutely attractive by its wonderful layout. Also, you can promote your media in the most interesting way using this template. Royce is a pretty simple template. However, it is pretty bold and offers certain features that can greatly keep your visitors engaged in the content. Royce can be used for inviting more and more guests to celebrate good times and great stories. If you are a music enthusiast or an artist, this is the most ideal template for you to run your blog to share your music and updates. Furthermore, it offers an outstanding bold grid template with SoundCloud integrations. This template will certainly help you in keeping your fans updated on your latest events and music. Juke is another brilliant template for musicians with an excellent layout and incredibly powerful eCommerce integration to reach their fans all around the world and sell their albums. Besides, they could use the Soundcloud block to connect on social platforms. Also, they could use the BandIn Town block to keep their fans updated with their tour dates and sell tickets. If you want to create an instant impact upon your visitors, there’s obviously nothing better than Henson. Henson comprises a wonderful blend of various layout elements to give your blog the desired elevation from a large intro area, minimal layout, to an understated menu and stacked gallery. With Henson, one no longer needs to run a blog in the conventional pattern anymore and in fact, it offers a lot of flexibility for one to present one’s contents in anyway way one would like to. The template York is designed exclusively for a wide variety of portfolios. Using York, you can probably have the most creative portfolio for yourself no matter which field of work you belong to. If you are looking for a template with a simple yet elegant and professional look, Wells is the ultimate template for you. The template is ideal for artists, photographers, and businesses that want to create a quick impact on its visitors. It’s certainly the simplicity of this template that makes it incredibly powerful as visitors could connect with it pretty fast without having to face any difficulty in the finding the content. Sofia offers features such as a brilliant long scrolling format and call to action that can largely help one in reaching out to more clients. Mercer is another unique template for independent designers as well as big brands. The power of Mercer actually lies in letting its users convey the meaning of their work in a cinematic way. It offers an amazing blend of the grid layout and parallax scrolling to create the best cinematic effect for your clients.